After years of sanding cork and carrying on I fell in love with these made from laminated craft foam. They cast great, do a big authoritive POP, and in the right hands can make as much racket as a buzzbait. Just forget it's a popper and start speed-stripping it like a big streamer, the flat face and cinched down waist causes some really cool things to happen. Make them as big as you can cast, the bigger the better. It is cheaper to make your own..and you don't spend much more time if you are going to paint or epoxy them. Usually just do foam blockhead style poppers on a disk sander. No paint, and you can shape a head in less than a minute. Buy the big foam letters at the craft store. Balsa or cork poppers are more involved, but still no big deal. Dipping in a can of paint is quicker than spraying the darn things. C’mon Gavin. You know if you don’t spend forty hours on them you won’t catch any fish! It’s probably dumb but it’s fun being dumb sometimes. Making them pretty catches the fisherman's eye and not necessary the fishes eye. I like the art part of what I do. Not others cup of tea but like Ronnie says, Fun. I use automotive paints and clears because that’s what I’m used to. But that’s not practical for most. Good epoxy and a turning wheel is a thing of beauty. What Ronnie said above and if you want to see what I do, search or go to fly recipes on here. The popper step by step build and then the build revisit. 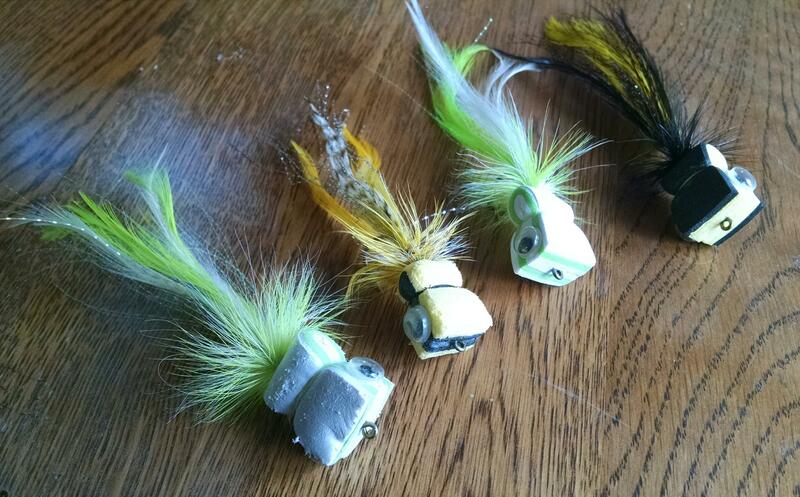 On this thread fly tying discussions look for the fry build. So many options for you to explore from all the guys on here. these look awesome Wrench!! I would love to learn how to make those!